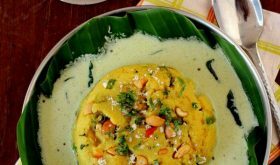 Mavinakayi chitranna is flavorful raw mango rice preparation that is prepared on the same lines as chitranna, pulihora or puliyogare. Here the souring agent is raw green mango instead of tamarind pulp. 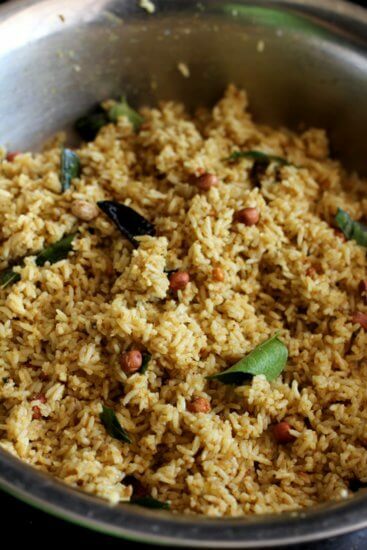 This is a treasured South Indian rice recipe that you cannot go wrong with. A dear friend visited us over the weekend and I prepared lunch using home grown ridge gourd, raw plantain, and raw mangoes. It definitely feels very good to prepare dishes using home-grown produce. 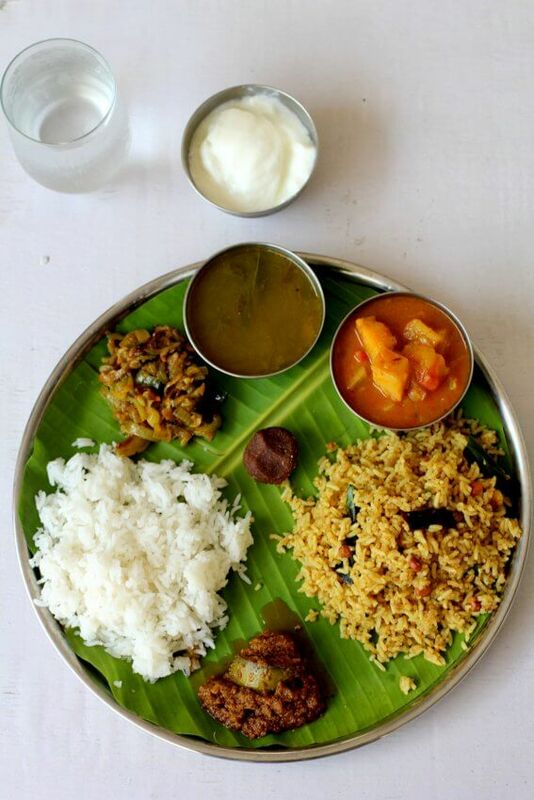 The lunch menu included beerakaya vepudu (ridge gourd fry), charu, aratikaya pulusu (raw plantain stew), mavinakaya chitranna with steamed rice, pacha avakai (yellow chili mango pickle), telagapindi vadiyam and yogurt. My blog is buzzing with a lot of mango recipes as it is literally raining mangoes in my backyard garden. I am done with my mango pickling this year. Yes, I have just finished making Avakai, Andhra mango pickle. In spite of giving away boxes of mangoes to family and friends, I still have a lot of raw mangoes that are being allowed to ripen. 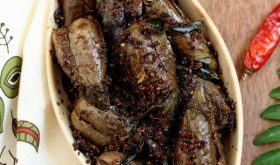 I have been wanting to share mavinakayi chitranna recipe with you since quite a while as its a favorite in our home. The spices that going into its making lend the dish a lovely aroma and flavor. It is definitely a time-consuming rice dish as we need to dry roast the spices individually. But it is definitely worth the effort. Let me tell at the outset that you should not skimp or skip any ingredient that calls for the making of chitranna masala powder. Also, you need to patiently dry roast each spice or ingredient on low-medium heat till the aroma emanates the kitchen. Slow dry roasting is essential. Do not burn the spices as it will ruin the masala powder flavor. Do attempt this recipe only if you have access to all the ingredients mentioned in the mavinkayi chiranna recipe. If you want to savor the authentic flavor of this traditional mango rice dish, please follow the recipe to the T.
Raw mango works best but a mango that is just beginning to turn a very pale yellow will also work fine. The mango should have a tart flavor. The steamed rice should be soft on touch yet hold shape, i.e each grain should be separate. Grated mango is cooked in a tempering of spices like mustard seeds and chana dal and the chitranna masala powder, jaggery, and salt. 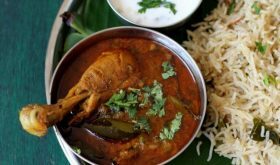 The chitranna gojju (gojju is a term used for thick gravy) should be cooked till the oil separates. Sesame oil works best though you can use any cooking oil. The below recipe will yield enough gojju or puliyogare mix for 450 to 500 gms uncooked rice. 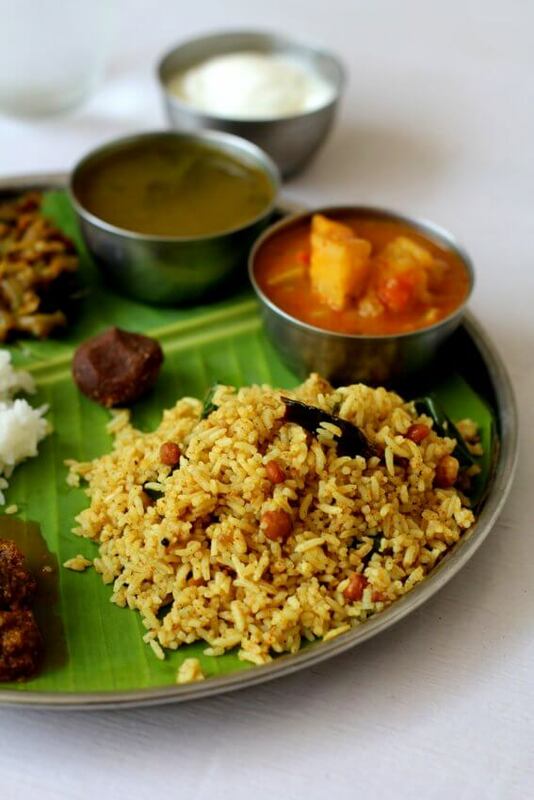 If using 250 gms uncooked rice, use only half of the prepared gojju. The remaining gojju can be refrigeted and used as and when required. 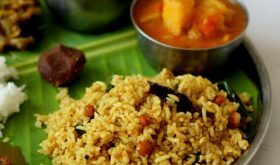 The flavors meld well after a couple of hours of sitting, so this Karnataka’s special rice dish makes for a perfect travelling food or lunch box recipe. Packed with nutrition from the mangoes, and spices, mavinakayi chitranna is sure to brighten up your meal. 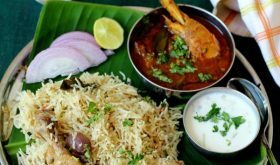 It makes for a simple, warming, nourishing meal along with a bowl of yogurt, crisps like papad or appadam. Absolute comforting food for the body and soul. Cook the rice in enough water till soft and such that each grain is separate. Ensure that it is not at all mushy or too soft. Remove to a wide bowl, add 2 sprigs of curry leaves and allow the rice to cool. You will have to dry roast all the ingredients listed under 'for chitranna masala powder' on low-medium heat, constantly mixing the spices. In a small pan, add the mustard seeds and allow them to dry roast till they splutter. Remove and set aside. Next dry roast the chana dal till it turns red. Remove and set aside. Next add, sesame seeds and roast for 3 mins. Remove and set aside. Next dry roast red chilies for 2 mins and set aside. Next dry roast curry leaves till crisp and set aside. Next, add the fenugreek seeds (methi) and roast till red and set aside. Next dry roast cumin seeds for 4 mins and set aside. Next dry roast peppercorns and cinnamon stick for a min and set aside. Next dry roast the peanuts and set aside. Finally, add the asafoetida and roast for few seconds and set aside. Cool, all the dry roasted ingredients and grind to a slightly coarse powder. Set aside the powder. To prepare the chitranna gojju, heat oil in a heavy bottomed vessel. Once hot, add the mustard seeds and allow them to splutter. Add the chana dal and split gram dal and allow to turn red. 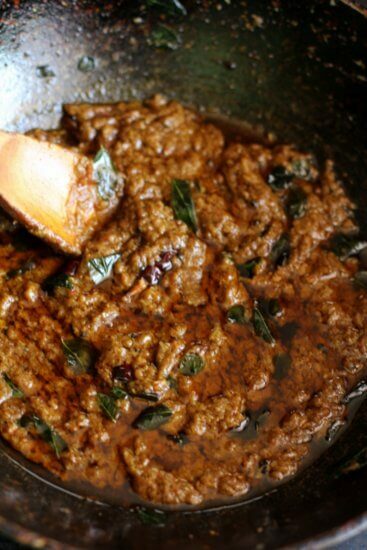 Add the dry red chilis, 3 sprigs of curry leaves, and asafoetida and saute for few seconds. Immediately, add the grated mango and saute for 6-7 mins. Add the ground chitranna masala powder, jaggery and salt to taste and mix well. Let it cook till oil separates. Turn off heat. 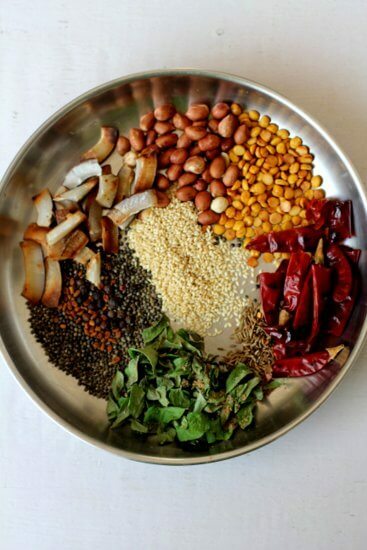 Add three-fourth of the prepared chitranna gojju and roasted peanuts to the cooled rice and mix well using your hand. Use a light hand to mix. Adjust salt and mix well. If you feel the mango rice needs more tang, add one or two tbsps of the prepared gojju and mix. Remove to a serving bowl and place lid. Allow the flavors to meld for a couple of hours or at least an hour. 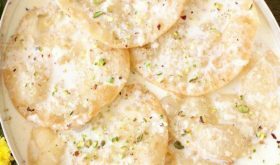 Serve with yogurt and appalam/pappadum. 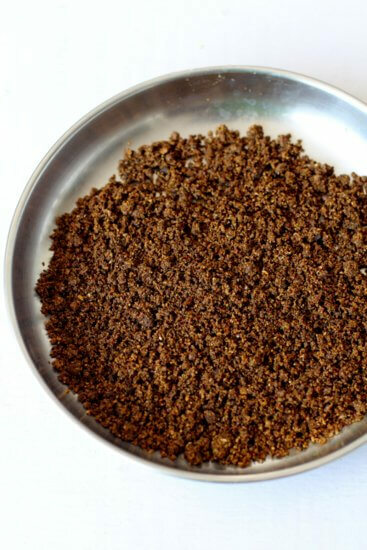 Taste the prepared gojju and if it is too sour, add 1 or 2 tsp of jaggery to the gojju and cook till oil separates. Any left over chitranna gojju can be refrigerated.